We love and adore our pets. And whether it’s our feathery friend or our beloved dog, traveling in the car with them can prove to be somewhat difficult. But if you think about it, traveling in a vehicle is just as stressful for Fido as it is for you. Mainly because your dog is in an unfamiliar location not knowing where you are taking him. In fact, any time you take him for a ride, he knows that he winds up at the vet’s office and that is never a pleasant experience. 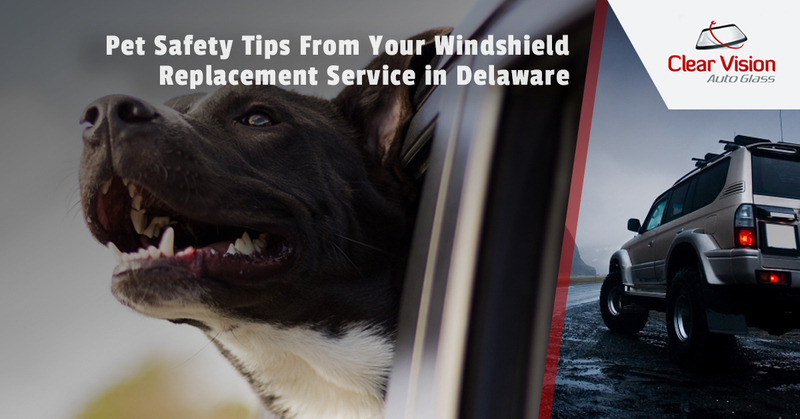 But fear not, Clear Vision Auto Glass, your windshield replacement service in Delaware, offers you tips on making traveling in the vehicle easier on you and your pet. Fido finds great comfort when he is seated right next to you, or right on you as the case may be. If you have ever traveled with your dog, you know that they just love to try to climb in your lap while you are trying to navigate the streets. Not only can this be rather annoying, it can be dangerous as well. There is no use scolding the dog, after all, he is only trying to find a little comfort and love. You could put Fido in a cage, but that won’t make him very happy and he might act up by whining or howling. The best thing you can do is to create a sanctuary for him by placing a dog bed or some blankets and pillows on the back seat. You might want to include his favorite toy as well. It is also a good idea to bring water and snacks. Your pets aren’t meant to travel with you and cars aren’t built to carry them. Fido can’t really sit in the back seat with a seatbelt on, he would rather be wandering around bugging you. There are pet travel products on the market that you can utilize, such as a harness you can use on Fido that easily attaches to the seatbelt. Even with these safety devices in place, you should still obey traffic laws and drive as safe as possible to ensure both you and Fido get to your destination unharmed. When traveling in your car with a pet, take the best possible route to your destination. If you are headed to the vet’s office, but the regular route is full of twists and turns, you might want to find another way to go. You see, Fido is just like us in the sense that he can suffer motion sickness; he can get car sick. So save your upholstery and carpet by finding the most mellow route possible. The most important thing to remember when traveling with Fido is to make him as comfortable as possible. Also, it doesn’t hurt to give him a pep talk and praise him for being such a good boy. A cracked windshield is not a safe windshield and puts you and Fido in danger. It is best if you have it fixed or replaced by Clear Vision Auto Glass.